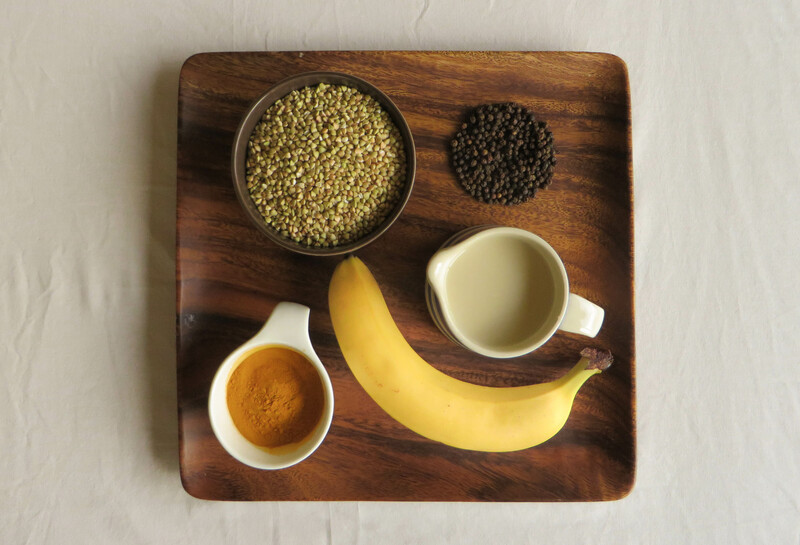 Raw Buckwheat and Turmeric Porridge – One Hungry Thespian. Breakfast has a special place in my heart. As soon as I get out of bed I relish nothing more than filling my grumbling void of a stomach with something satiating and substantial. This is partly due to necessity, as I’ve been informed that I’m not the happiest of campers when hungry, but largely because I love eating and breakfast is the first eating experience of the day.I’m sure you know several people who swear that they’re fine not eating breakfast, and, in fact, find that eating first thing only makes them hungry for the rest of the day – I, however, am not one of those people. Should you encounter me before I have eaten, or happen to stand between this bleary-eyed teenager and a bowl of porridge, I apologise in advance. I’m sorry. It’s not you, it’s me. As the seasons change (come on though, it’s Autumn now and we’ve had one cold day) I find myself reaching for different types of foods, not only to provide different and more exciting flavours, but also to keep me full for longer. Now that I’m working nearly full time and on my feet all day, my school-routine-accustomed body needs fuel like never before. It’s also the time of year where my immune system tends to fall behind a little and I become more succeptible to coughs and colds. Because I can’t afford to get sick at all for the next three weeks – a play I’m in opened a few nights ago – I’ve started relying on my diet more to boost me up and keep me at my best. 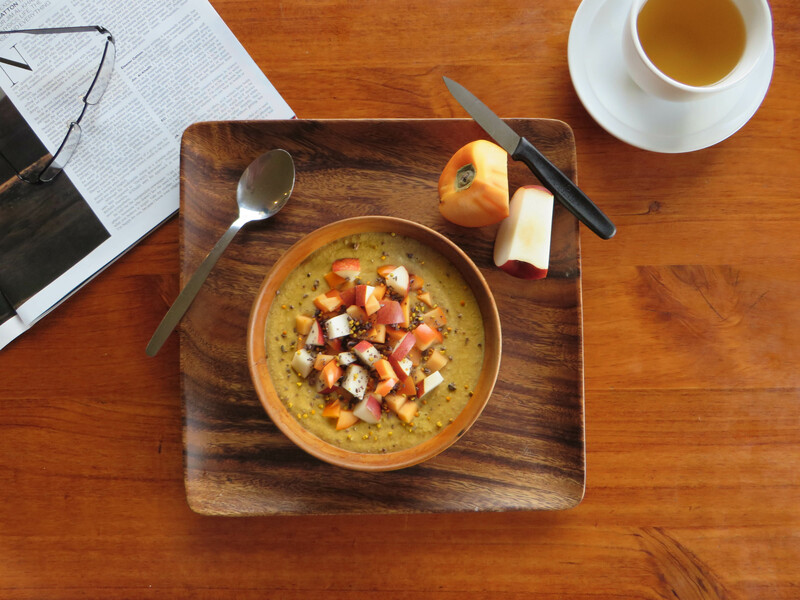 This recipe is a direct result of that, managing to keep me satiated and help keep the colds at bay. Let me introduce you to my double whammy breakfast dream team. Profile one: Buckwheat, nutritional superhero. Buckwheat, contrary to its name, is not actually related to wheat at all. In fact it’s not even a grain, but a fruit seed related to plants like sorrel and rhubarb, which means it doesn’t contain any gluten. This makes it perfect for those who are gluten-intolerant, obviously, but it’s also so nutritious it would be silly for the rest of us not to eat it as well! 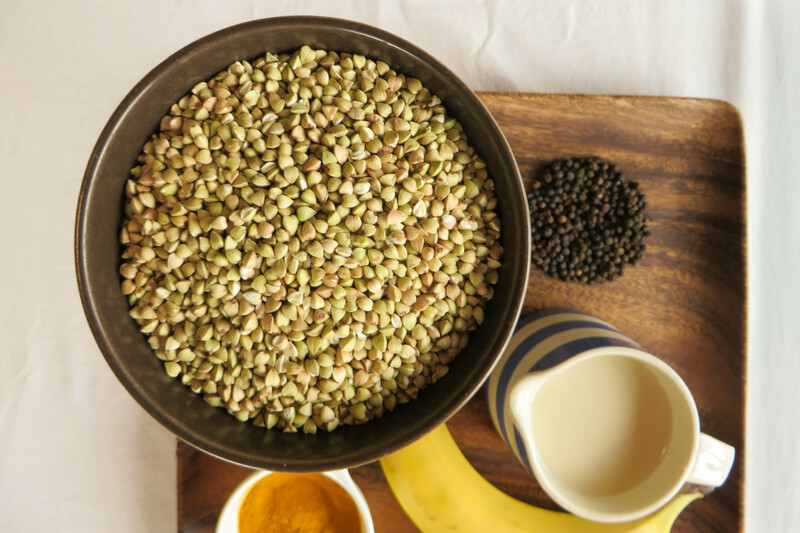 Buckwheat is a complete protein, as it contains all nine of the essential amino acids, so it’s a great choice for those who don’t eat animal products. It’s especially easy because it doesn’t need to be combined with any other foods to provide a high quality protein, and it’s ridiculously versatile too. It can be ground into flour and used for pancakes or for baking, it can be toasted and cooked (heard of Russian Kasha? ), it can be added to muesli and granola mixes for crunch, and it can be soaked in water to soften it to make a raw porridge. On top of all that it is packed full of fiber, antioxidants, vitamins and minerals. Oh, and did I mention? It’s delicious. Profile two: Turmeric, inflammation fighter. Turmeric has been regarded as a powerful healer for thousands of years in Ayurvedic medicine, and recent research is proving just how potent and incredible it is. 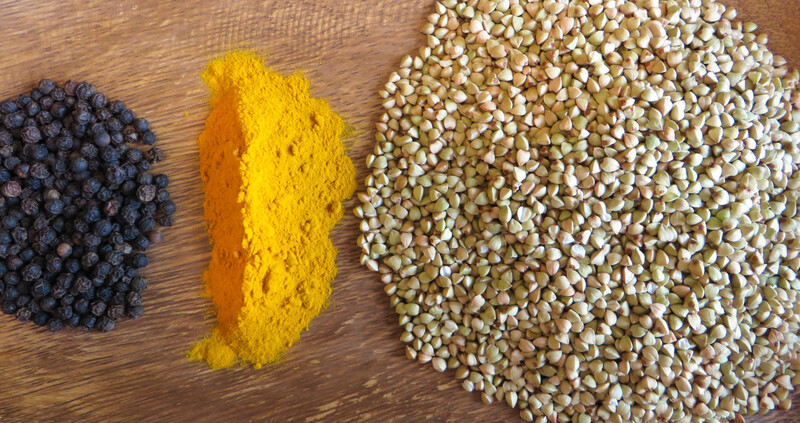 The vivid yellow hue of many Indian dishes can be attributed to the use of turmeric, however the colour is thanks to its active ingredient curcumin. This super bright coloured pigment is one of natures finest anti-inflammatories, meaning it helps reduce inflammation (read: damage or sickness) in our body. Inflammation in itself is not always a bad thing, in fact it’s a necessary part of fighting off bugs in our body, but the problem is when it goes on for a length of time. Chronic (long lasting) inflammation is a factor in many common Western diseases, but our hero curcumin can inhibit all sorts of the molecules which play a part in causing the inflammation! Interestingly enough though, curcumin is actually poorly absorbed by our bodies. This means that we can eat all the turmeric we want, but most of the good stuff doesn’t make it into our bloodstream. When consumed with another awesome ingredient, piperine, the amount of curcumin we absorb skyrockets. Where can we get piperene? Black pepper. In fact, adding a pinch of pepper whenever you use turmeric can increase the amount of curcumin your body absorbs by an astonishing 2,000%! Moving onto the actual food now. This breakfast has been my saving grace. It’s easy, cheap, nutritious, filling and it even helps keep the sniffles at bay. I nearly always soak the buckwheat overnight in a glass of water, but if you’re not the organised type (ahem, monday mornings) then a quick soak while you have a shower will do the trick. 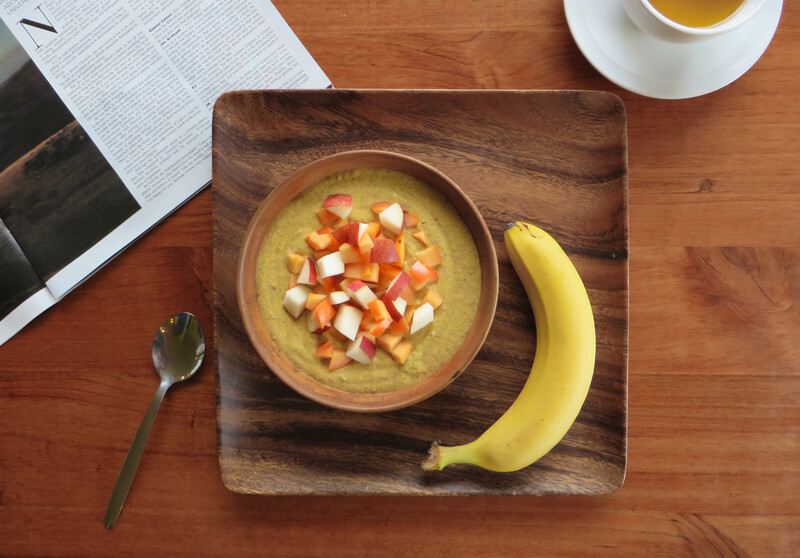 Imagine sitting down to a giant bowl of this before a big day. Forget bacon and eggs, mate. Buckwheat porridge is where it’s at! This recipe is totally adaptable. If you’re not into bananas, just use a touch more milk and some honey or maple syrup for sweetness. Why not even throw in a little cinnamon while you’re at it. Use whatever milk you have on hand, coconut water or even plain ol’ H20. Add in a few dates and some cocoa if you want, or use apple juice, fresh ginger and a pinch of ground cloves. Just promise me that you’ll try it with turmeric and black pepper, too. Place all your ingredients in your blender jug or stick-blender vessel and blitz like there’s no tomorrow. A small food processor will mix it but you mightn’t get it as smooth. Serve, topped with whatever your heart desires. 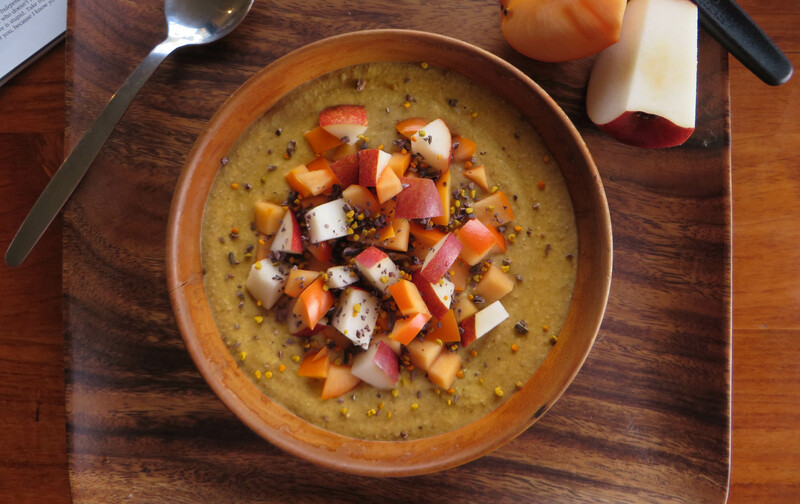 Today, I opted for fresh pear and persimmon, bee pollen and cacao nibs. Who knows what tomorrow will bring? Serves 1, but is easily doubled. This is an incredible idea! I’ve never seen anything similar. I’m going to have to try this, looks like a powerhouse bowl. Do you eat this cold or warm? I can’t do much warm cereal in the summer but come this winter I’ll be downing this as I’ve just recently realized the amazing benefits of Turmeric and taking it in the raw is for sure the best! Cold, for sure. Super refreshing when it’s hot out!